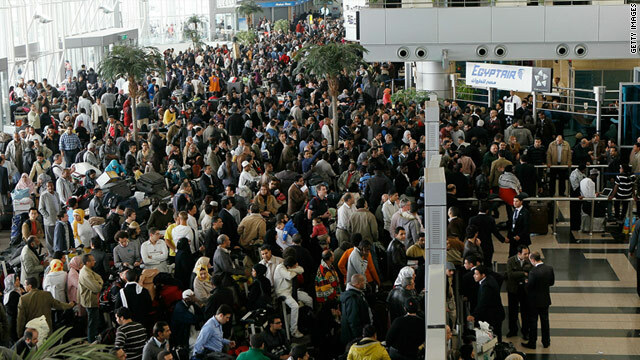 A large crowd overwhelms a hall at Cairo International Airport this week as people try to catch flights out of Egypt. Follow live blogging on "This Just In" and the latest tweets from CNN correspondents from the protests. Send your video, images to CNN iReport. Washington (CNN) -- With a rapidly deteriorating situation on the streets of Cairo, the U.S. State Department is urging Americans who want help getting out of Egypt to "take advantage of U.S. government charter flights while they are available." "As you know, we cannot demand that an American leave, however, we certainly push for them to leave," said a senior State Department official, who spoke on background because he was not authorized to use his name. According to the official, the State Department is cutting back on the number of flights Thursday because some of those charters have been leaving with empty seats. On Thursday morning, one flight was fully booked and boarded, and takeoff was imminent, he said. An additional flight was on the ground, the official said, "but isn't even near halfway full." About 3,000 Americans have registered to be evacuated. So far, 2,000 have been flown out on U.S. government charters to European locations. Since Monday, the State Department has been running an average of four flights a day. Depending upon demand, more flights could be added, but the official said if circumstances suddenly got worse, they might have to order charters from other cities in the region and that could take time. The State Department is urging U.S. citizens who want to leave to come to Cairo International Airport as soon as possible. They should bring travel documents with them, but even citizens who have passports that expired up to 10 years ago can come, and U.S. consular officials will assist them. Commercial flights from Cairo still are operating, and many Americans, according to the State Department, have already left via commercial airlines, private airlines and other governments' chartered flights. At last report, the Cairo airport terminal is relatively orderly, according to the department. It continues to assess whether or not flights will operate Friday and possibly Saturday.